The Powell or The Trump Put? After the worst October since 2008, stocks rebounded in November but not enough to make up for the losses in the previous month. As I stated last week, it might not be bear market time for the overall market but the FAANG stocks got clobbered in October and remain weak. While all eyes are on the G20 meeting and Trump and Xi’s dinner, the big news this week was the Fed Chairman Jerome Powell saying on Wednesday that the central bank’s benchmark interest rate is “just below” neutral. That unleashed a massive rally on Wall Street on Wednesday, but after reading his prepared remarks, I think a lot of people are getting way too excited about the so-called “Powell put”. In other words, the Fed realizes the cumulative effects of their soon to be nine rate hikes are starting to hit financial markets and the US housing market and don’t want to commit to three more rate hikes next year. He’s absolutely right, banks are collecting huge spread and compensation is out of whack but I’m sure some academics at Harvard or Yale’s business school will defend the current bloated compensation structure at corporate America so their very wealthy alumni can keep donating to their large endowment funds. The system is rigged folks, it’s been rigged forever to favor the affluent class. Even financial markets are rigged with some participants getting information seconds ahead of others which is all they need to have an “edge” and make a killing in markets. Anyway, don’t get me started on that tangent, it will devolve and get ugly very quickly. In fact, on StockTwits today, I recommended buying out-of-the-money calls on Goldman’s shares at these levels and hedging that with some puts (2 to 1 call/put ratio). 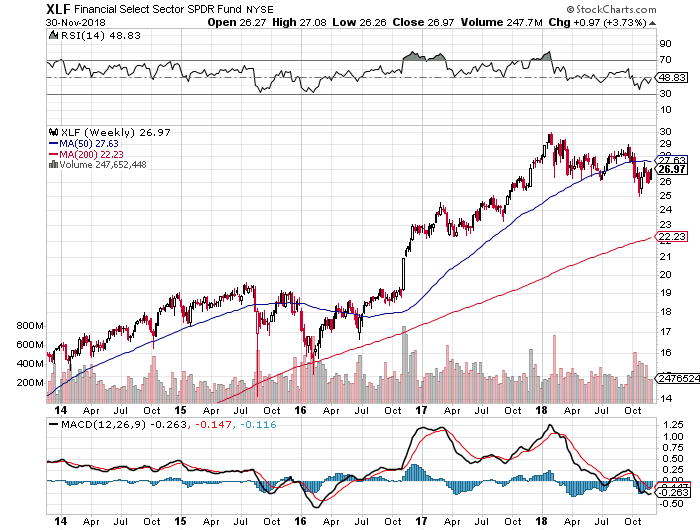 I realize that chart is bearish and signals more downside ahead, but either Goldman leads the rest of the banks or something is way off and the premium other banks are receiving here is ridiculous. People have this irrational hatred toward Goldman. They need to relax, it’s a great bank with a boat load of smart people printing money. I’m sure their traders are thriving in these volatile markets. Anyway, back to the G20 and the Trump – Xi dinner. I’d be surprised if there is a major positive announcement, however, Trump has shown his cards, he tracks the stock market very closely. If Powell is now on the fence, it’s up to Trump to do something on trade to ease fears in the stock market. He might say there will be no new tariffs on China as the US continues to negotiate trade with that country and that might be enough to lift Chinese and US shares higher.
)) were both up big on expectations some good news will come out of the G20. 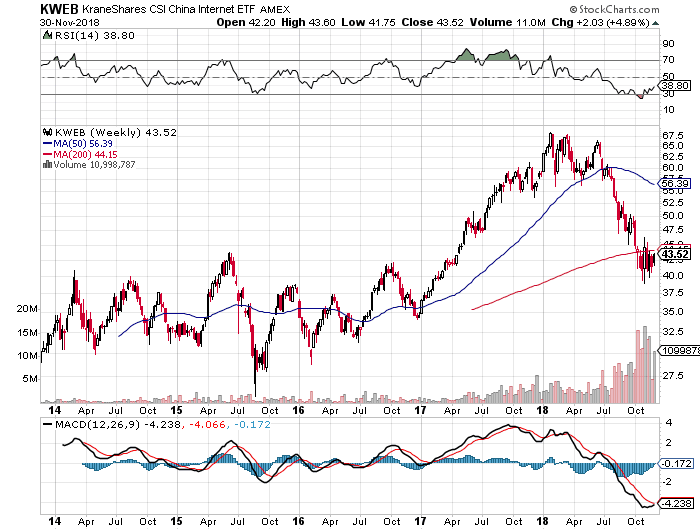 If you believe China is turning the corner, you should be loading up on these ETFs, especially KWEB. 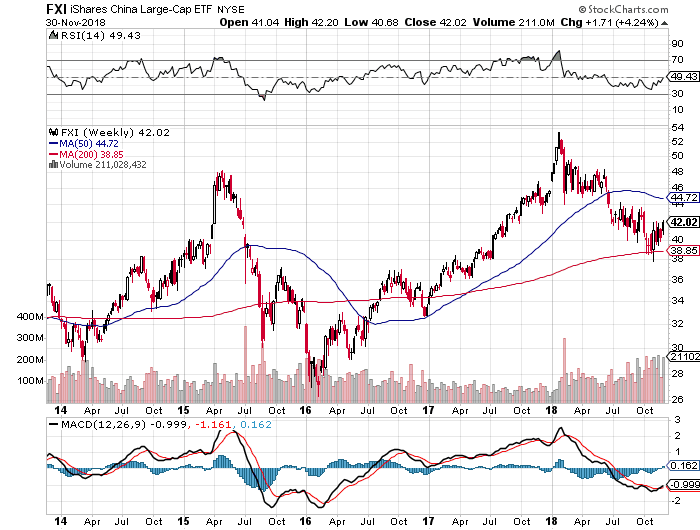 I remain skeptical as China just reported its weakest factory growth in over two years on eve of US trade talks, but I remain open-minded and I’m tracking these ETFs very closely. Below, Lori Calvasina, RBC Capital Markets head of US Equity Strategy, and Bruce Bittles, Baird chief investment strategist, discuss markets ahead of the G-20 summit in Buenos Aires. Second, Neel Kashkari, Minneapolis Fed President, joins ‘Squawk Box’ to discuss the state of the labor market, neutral rates and the chance of a recession. Third, Gluskin Sheff’s David Rosenberg believes a liquidity squeeze could hit stocks hard next year, stating people are ignoring the ‘elephant in the room’. Very interesting comments, listen carefully to Rosie’s comments. Trade )) as 2018 comes to an end. 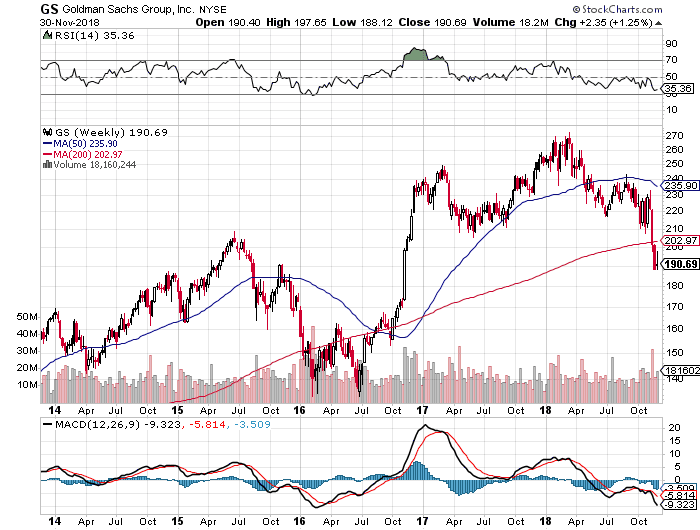 While the rest of the market struggles to get back up to record highs, consumer staples stocks like Church & Dwight and Hormel have quietly rallied to new highs. Mark Newton of Newton Advisors and Erin Gibbs of S&P Global Market Intelligence discuss whether their rally can continue.